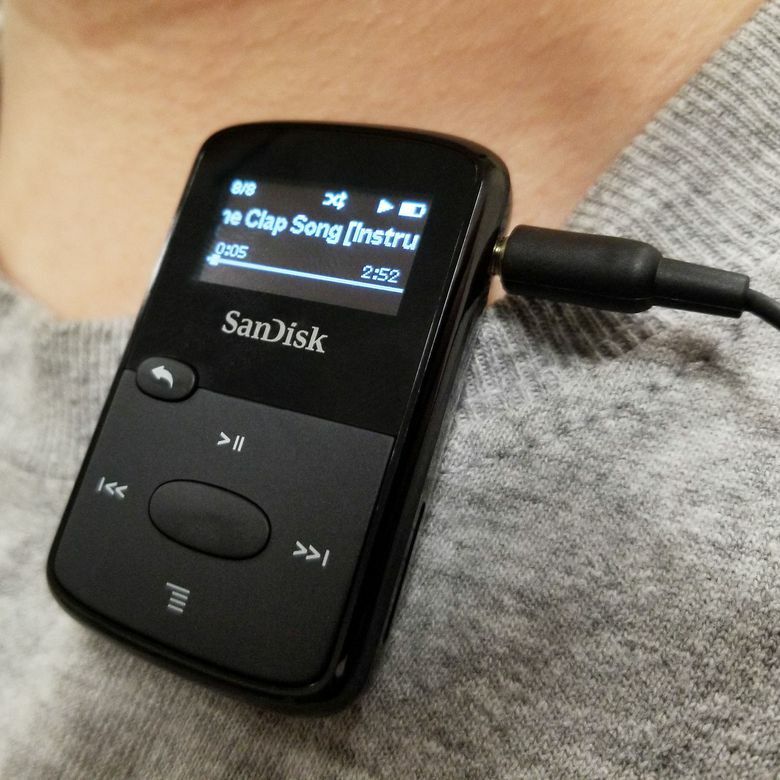 The SanDisk Clip Jam MP3 Player is a mighty device in a small, budget-conscious package. Expandable storage and a long battery life make it the perfect MP3 player for gym-goers who don’t want to think too much about their tech. In a world of overpriced MP3 players that want to extol the virtues of every feature they possess, it’s sometimes refreshing to have some simplicity. The Clip Jam MP3 Player from SanDisk is one such device, with an unassuming form and a downright bargain bin look. The tiny device has some of the highest potential onboard memory around, not to mention a battery life of near 20 hours. Add in some runner-friendly features such as an FM radio and a lightweight build, and you have the makings for one of the best budget MP3 players available. We like light, small devices that we can clip onto almost anything. The Clip Jam certainly fits the bill, as it doesn’t even weigh a full ounce. This tiny, plastic rectangle is light enough to go on a hat, the collar of a shirt, or even our glasses. The OLED screen is bright and high-contrast, along with a series of six front buttons that all have a nice “click” to them when pressed. Volume rockers on the side are unassuming, though sometimes required a harder press to activate. The budget price of the Clip Jam clearly comes from the fact that the device is made with cheap plastic. Likewise, the face buttons are finished in a matte coating that’s prone to scuffs and scrapes. After only a few uses ours was scratched up. It’s worth mentioning that this device isn’t sweatproof or waterproof in the slightest, meaning that the side microSD slot, micro USB slot, and audio jack are all open to taking in liquid. While ours was fine, a quick look over user reviews online showed that the Clip Jam is prone to failure thanks to these open slots and a weak seal on the plastic case. This is worth keeping in mind for those looking to build up sweat in your workout. It’s worth mentioning that this device isn’t sweatproof or waterproof in the slightest, meaning that the side microSD slot, micro USB slot, and audio jack are all open to taking in liquid. The Clip Jam’s actual clip lacks serrated teeth like other devices in the market and also doesn’t open particularly wide. As such, it does jostle around a bit. We’ve also been spoiled by the 360-degree movement of other device’s clips such as the H20 Stream, so your positioning does matter more with the Clip Jam than with other devices. Luckily, the included earphone’s long cable makes up for this lack of movement. Transferring data over to the Clip Jam is a breeze and done via a provided micro USB cable. That’s a refreshing change so so many other MP3 players have their own proprietary cable or dongle. It was nice to return to a more universal standard. The Clip Jam supports folders for additional compartmentalization, as well as not requiring you to format your iTunes library to MP3 before transfer. We were also impressed by how many data the Clip Jam can hold. If you take into account its 8GB of onboard memory and put a 32GB microSD card in, you get a total of 40GB, which is impressive for such a tiny device. Transferring data over to the Clip Jam is a breeze and done via a provided micro USB cable. One of the best features of the Clip Jam is its wide variety of supported file formats, including MP3, WMA (NO DRM), AAC, WAV, and Audible (DRM only). All of these come through crystal-clear, thanks in part to a strong equalizer in the Settings menu. Whether we were listening to music, podcasts, or an audiobook, everything came through with no distortion or tinniness. Our major concern initially was the FM radio mode, as these onboard radio options usually don’t sound great. We’re happy to report that the Clip Jam’s radio came through loud and clear, even if we wish it had the ability to do AM radio. The almost 20-hour battery life of the Clip Jam actually outlasted the amount of time we used the device in its week-long trial. That’s a long time to not have to worry about a charge, and more importantly, it kept us from relying on our phone or music. After running the battery dead, we found that it took around three hours for a full charge. You won’t find too many other devices with the suite of features and longevity that the Clip Jam possesses for under $40. That lower price does mean that the MP3 player feels a bit on the cheap side, but the price is low enough that the Clip Jam is easy to replace even if it breaks. And in the case of device failure, the one-year limited warranty will come in handy. Despite MP3 players seeming like dated technology, there’s some competition in the market. The Sony Walkman NW-WS623 wireless headset is an expensive, feature-rich device that is sometimes more trouble than it’s worth due to uncomfortable earbuds and a short cord. The high price tag might be hard to swallow for those that just want a tiny device like the Clip Jam that they can use and abuse. Providing a more versatile, durable product is H20 Audio with their Stream waterproof MP3 player. Similar in shape and size to the Clip Jam, the Stream hangs on tighter and better to your body than the SanDisk device, but comes at the trade-off of less robust sound and a lower overall volume. Of the three we used during our regular workout routine, the Clip Jam provided the least amount of problems and worry, thanks in part to its lightweight and long battery life. The SanDisk Clip Jam is a wonderful, small MP3 player with a robust amount of features and a fantastic battery life. If you don’t mind a tiny device that looks and feels a little on the cheap side then you’re in for a great sounding audio experience with more memory capacity than you’ll ever actually need. Product Dimensions 0.6 x 1.6 x 2.6 in.